I'm absolutely ecstatic! I've been working for WEEKS trying to get music at Ambat, having to contact and get permission from the stream owner as well as dealing with multiple helpful Lindens and LL its juggernaughty self. Finally, today the music was set up. 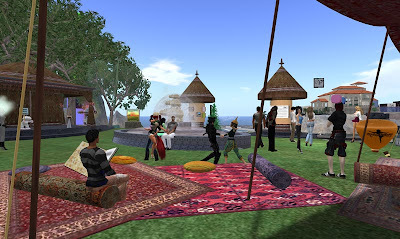 I rezzed my Syncdancer and within a minute couples were dancing all over the infohub :-D It was awesome fun, and I even got a nice IM from someone who not only wrote an nice blogpost, but said, "ty for creating Ambat! This little mound of dirt has been a very important place to me :)"
That's Blondin by the Hippobookamus. He was the one who threw the switch. Thank you also to Joppa Linden, Teeple Linden, and Martini in the Morning radio. You have brought your formidable creative energy to Ambat, and persevered over the long haul to make it a place to gather happily. Congratulations on the addition of music. Tiny as it is, I get IMs quite often from people who have concerns they'd like me to address, comments, or just want to say thank you to me. I value that a lot. Maybe the music is dem der fat ladezz singin'?